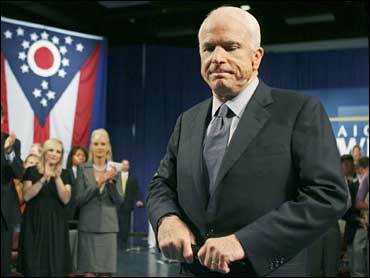 John McCain's campaign said Thursday it is returning $50,000 in contributions solicited by a foreign citizen. The New York Times reported Thursday that Sargeant allowed a longtime business partner, Mustafa Abu Naba'a, to bring in some $50,000 in donations in March from members of a single extended family in California, the Abdullahs, along with several of their friends. The Abdullahs and other Arab-Americans in California also contributed tens of thousands of dollars to Democrat Hillary Rodham Clinton and Republicans Rudolph Giuliani and Florida Gov. Charlie Crist, a longtime friend of Sargeant. According to the Times, Abu Naba'a is a dual citizen of Jordan and the Dominican Republic. It is illegal for foreigners to contribute their own money to U.S. political campaigns, and McCain's campaign said Abu Naba'a did not do so. But McCain spokesman Brian Rogers said some of the people solicited by Abu Naba'a had no intention of supporting McCain for president. Rogers said "that just didn't sound right to us" so the money is being returned. He estimated the total at less than $50,000, saying "we think we have a pretty good estimate of how much Abu Naba'a solicited." At the same time, the campaign sent a letter to everyone whose donations went through Sargeant, reminding them that federal law bars campaigns from accepting contributions from foreign nationals and that all donations must come from their own funds, without reimbursement. Eight months ago, a top fundraiser for Clinton, Norman Hsu, was indicted for making contributions to various political candidates in the names of others. Arizona Sen. McCain is co-sponsor of the campaign finance reform law that bears his name and the move is an effort to resolve any questions involving Sargeant before it turns into a major political problem for the candidate. Sargeant, who does extensive business with the federal government, is facing problems on Capitol Hill. A House committee chairman, Rep. Henry Waxman, D-Calif., is looking into Sargeant's defense work shipping fuel to U.S. bases in Iraq as part of a probe into whether contractors are overcharging the Pentagon. Sargeant and Abu Naba'a are being sued in Florida by a former partner, the husband of a half-sister of the King of Jordan. The lawsuit alleges that Sargeant and Abu Naba'a swindled the business partner out of his share of the profits from valuable contracts with the U.S. government. The plaintiff, Mohammad Anwar Farid Al-Saleh, says he obtained authorization from Jordan to permit Sargeant's company to ship oil across Jordanian territory to U.S. bases in Iraq. A 2004 advisory opinion by the Federal Election Commission says a foreign national may lawfully solicit political contributions, but the issue is more complicated than that. Federal election law does not address whether it is legal for foreigners to solicit donations. At the same time, federal regulations say a foreign national may not participate in a person's decision-making regarding contributions. "The 2004 opinion is very clear, but throwing the regulation into the mix muddies the water. The FEC could revisit the issue," said Paul S. Ryan, an attorney at the Campaign Legal Center, a nonprofit, nonpartisan group.